Horticulture is both the art and science of people growing plants. Welcome to Master Gardener Volunteer training! People join the program for many reasons. A large number joined to learn more about horticulture so you can have better gardens at home. Others may have come to the program through someone you know. Perhaps you are already volunteering with a garden related project and you need more information on how to do it. Or maybe what brought you to the program is unique to you. You don’t need a green thumb to be a Master Gardener Volunteer. You DO need a willingness to learn new ideas and to share those ideas with community. Individuals earn their Master Gardener certification through Level 1 training, offered through your local UW-Extension office. 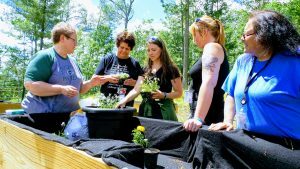 Those enrolled in the program will experience different learning opportunities, depending on the county UW-Extension office offering the program. Some counties utilize guest speakers for every class; others do a mix of hands-on activities, discussion groups, and field trips. With the introduction of this online component, individuals enrolled in any county now have access to the same lecture information provided by UW-Extension experts from across the state. Participants can learn by reading the manual and listening to the lecture at their convenience. Reinforcement materials, hands-on activities and other interactive opportunities can be offered in the class by your county UW-Extension educator or Master Gardener Volunteers. Think of it as the lecture and lab that comes with any college science class.Once accepted into Master Gardener training, to successfully earn your certification you must attend a minimum of 12 classes, pass the final exam with a score of 70% or better, and complete a minimum of 24 hours of approved volunteer activity by October 1 (earlier in some counties).Your county UW-Extension educator will inform you of any variances in your local program.